Although you may have already read about this past week’s evening of inventory, Taylor Fulton (Rick’s daughter) also wanted to share her perspective. This past Thursday, I had the opportunity to help Mission: Mobility volunteers do inventory on a warehouse full of medical equipment. This coming week (on Tuesday, to be precise!) we will load that equipment onto a container so that it may begin the long journey to Guatemala. Although labeling and sorting aren’t the most exciting of jobs, I was so excited to finally help out with this side of the ministry. The past four containers were loaded during the school year, when I was 8 hours from home, working on my Biology degree. Although Dad would send me frequent updates of Mission: Mobility progress, I couldn’t provide much help. This time, I got to join 18 volunteers from 9 different churches, sorting and wrapping and labeling and moving and stacking and arranging, preparing for this week’s loading process. With such good help, the entire process took less than two hours! In that time, we labeled and shrink-wrapped 76 wheelchairs, 88 walkers, 33 canes, 30 pairs of crutches, and more than 90 boxes of clothing and medical equipment. The Lord provided equipment, helping hands, and stamina, and His faithfulness continues to make itself evident! When my family visited Guatemala in the summer of 2011, we got to help Bethel Ministries provide individuals with refurbished wheelchairs. Some of these people were getting replacement chairs, but many others were becoming independent for the very first time. For the recipients, as well as their families, this was a life-changing gift. Can you imagine carrying your child on your back for his entire life? Taking him with you as you work in the fields, carrying him as you run errands, feeling him grow heavier each day? Can you imagine being the child born with a disability, knowing that you will never be able to play like your friends, never be able to get a job or even move independently? Indeed, both the recipient and his family benefit when receiving a wheelchair from Bethel Ministries. Not only does Bethel provide wheelchairs to the needy — they also provide jobs to some of the people they help. Upon arriving in Guatemala, each of the wheelchairs we marked will make its way to the Bethel Ministries workshop. 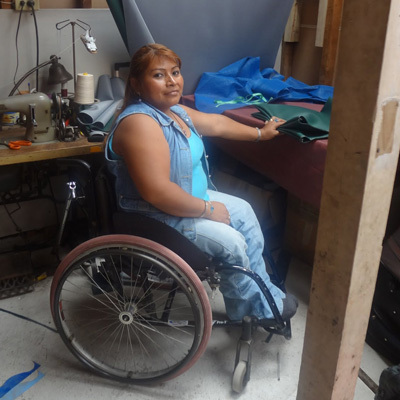 There, Marcos, Chico, Carlos, and Cheni – all of whom are in wheelchairs themselves – will repair and refurbish the donated wheelchairs, so that someone else can receive the same help that they did. The Lord uses these wheelchairs for so much more than meets the eye! They provide independence, yes, but they also provide jobs for native Guatemalans, and give Bethel the opportunity to share the Gospel with recipients and their families. 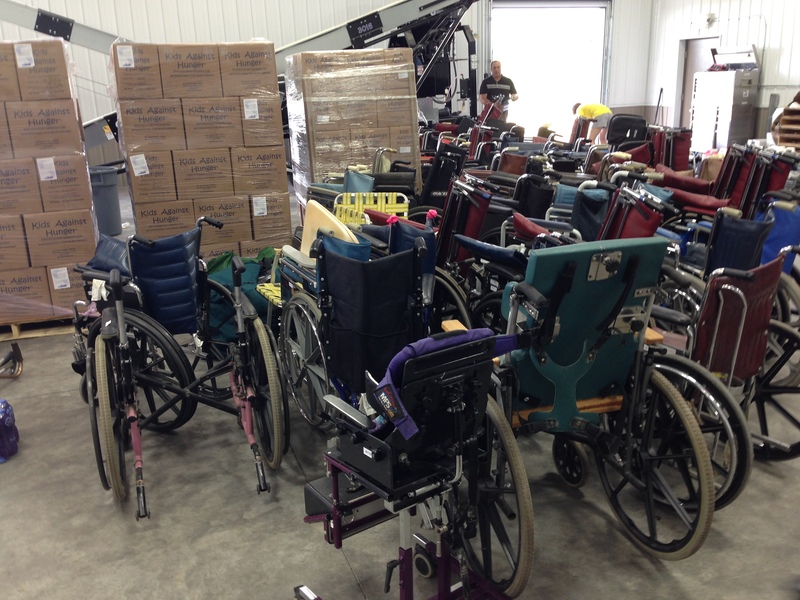 At the end of our evening of inventory, we gathered around the wheelchairs and laid hands on them. Bowing our heads, we prayed over the chairs, asking the Lord to work in the life of each wheelchair recipient. This summer, my family will again travel to Guatemala with Bethel Ministries International. Helping with this inventory made our upcoming trip feel so much more real. Although we will arrive in Guatemala long before the container, seeing the wheelchairs and serving with friends helped me picture what some of our trip will be like. 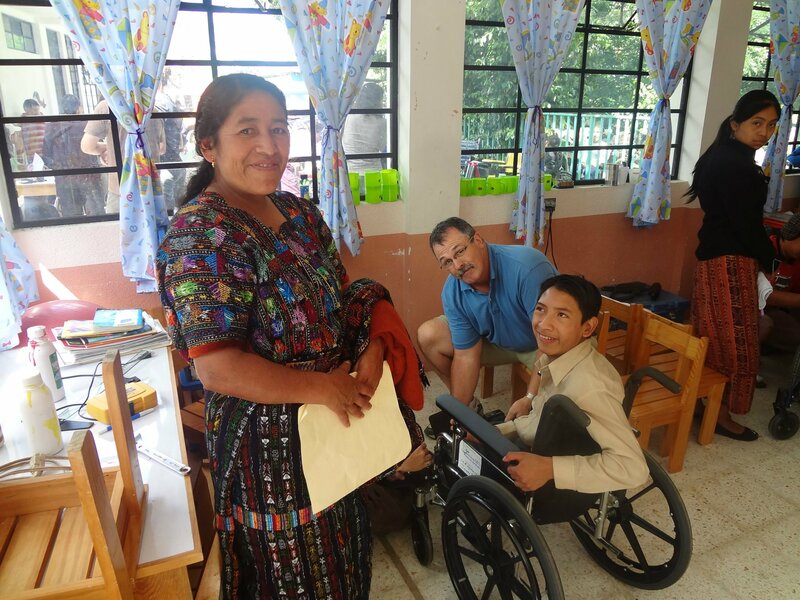 Similar to our trip in July 2011, we will spend one day in Guatemala distributing wheelchairs, and helping fit the recipients to their new possession. Just as each person is unique, each chair is uniquely fitted to each person – the perfect combination of head rests, foot rests, support pillows, and type of wheelchair are found and secured before the person takes their chair home. It is sometimes a long process, but overall, when you see the look on the recipient’s face, and recognize the change that the Lord has allowed to happen, you realize that every effort was completely worth it. It is not we who should receive glory, but the Lord. He is the one who brought the different parts of that wheelchair together. He knew that the wheels would come from Omaha, and that they would fit perfectly with the chair from Montana. He knew that, though the cushions from Wisconsin were old, Chani in the Bethel workshop could sew them so they looked good as new. He knew that the footrests from Pennsylvania and the headrest from Kentucky would fit in with this great amalgam, so that one little girl could have a chair that fit perfectly. More than anything, the Lord knew and loved that little girl, and provided her with the opportunity to both receive a wheelchair and hear the Gospel through a Bethel Ministries event. Our God is great! It is a wonderful blessing, to be able to serve him through Mission: Mobility. PS – Shameless plug here. If you’re not busy on Tuesday, come down to the Walker Seed Warehouse in Washington, to help us load the container! We would love to have you! This entry was posted in Uncategorized on July 7, 2014 by rfultonmission.